Line D in New York's subway (part of the 6th Avenue linen, part of the Queens Boulevard line, part of the 8th Avenue line and the Concourse line, all former IND), for the class R-68 subway train. 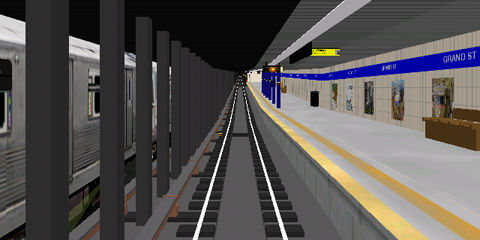 This line is entirely under the surface and begins at a layup track at Norwood/205th Street in the Bronx and goes to Grand Street at Manhattan, where this simulation ends. In the real world, the line continues to Coney Island in Brooklyn. Detailed line, both stations and trackside! Soft curves and realistic switches, announcement of all stations and connections. This line uses graphical objects from the NYCTA A line, which must be installed before this line can be used. This line has disappeared from the website BVEstation.